Appaloosa horses are beautiful horses and are very popular throughout the United States. 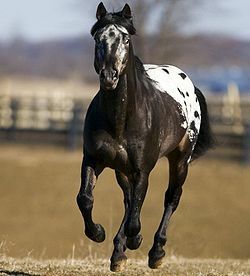 These horses are easily recognized because of their distinctive spotted patterns. They remind me of the horse's version of a dalmatian. The tails and manes of the Appaloosa are usually thin. There is a large amount of information on the genes of this horse that may eventually shed some light on how they obtained their unusual look. If you want to read more about this in detail, you can find this information on this horse wiki page. What we do know about this breed and its particular genetics is that it was originally created by native Americans and was maintained by the Appaloosa horse club. Why you might want to own one. These horses are great show horses and are good for sporting and rodeos. They tend to have good dispositions and are easy to train. Their endurance also makes them great for long trail rides. People prefer to use these horses more for riding rather than for any sort of pulling or farm work. If you plan on buying a horse to help you work on your farm, you should probably look into clydesdales or some other form of work horse.